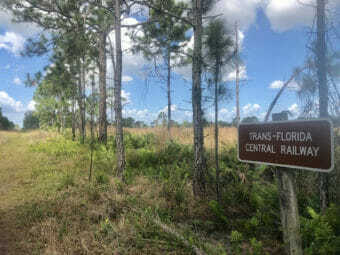 Biking the Trans-Florida Central Railroad Trail | Florida Hikes! The last few times we’ve driven to South Florida on I-95, we noticed a large pedestrian bridge being built. 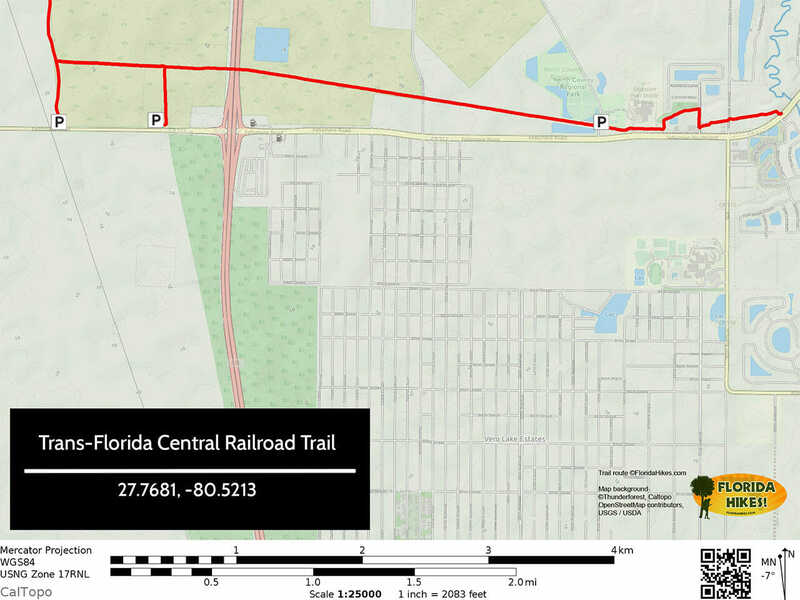 Eventually, words appeared on it: Trans Florida Central Railroad Trail. We figured it had to be a bike path, but we always seemed to go past when we didn’t have our bikes with us. 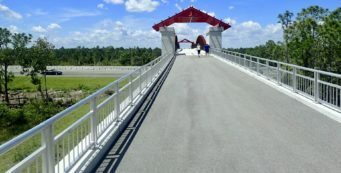 Looking online, we only found mention of two miles of paved trail, hardly worth a special trip to visit. On our trip this weekend to a Florida Trail event in South Florida, we decided to carry the bikes along and stop on our way home. There is a long gap before and after Exit 156, so you have to be on the lookout for it. We headed west toward the cell phone tower that has been made to look like a very big tree. I’m sure that someone made a lot of money convincing the powers that be that camoflauging the tower to look like a tree would help it blend into the natural setting. It would have if it were out west in a forest of sequoias or redwoods. Here, it makes a good landmark. Just past it, we turned in to the Fellsmere Trailhead Preserve parking lot. 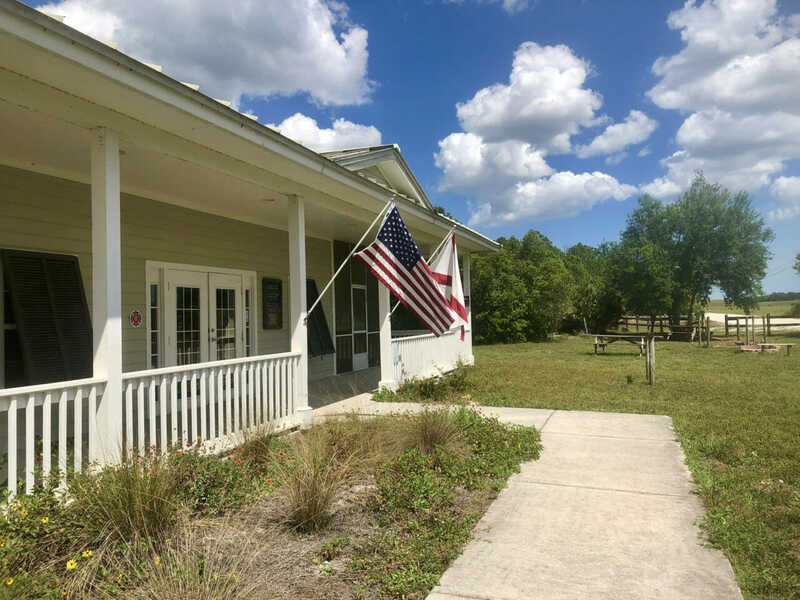 It has a small visitor center – mainly interpretive signs, maps, and a restroom – along with a playground and picnic table. The parking lot is also small. When we returned from our ride it was nearly full. Between the families in the playground and all the people we met on the trail, this trailhead could easily fill up on weekends and other busy times. A gravel road heads north from the trailhead entrance road, following a gas transmission line. It passes a climbing wall and meets a cinder path. Since there was a bicycle sign, we figured this must be the trail we were looking for. 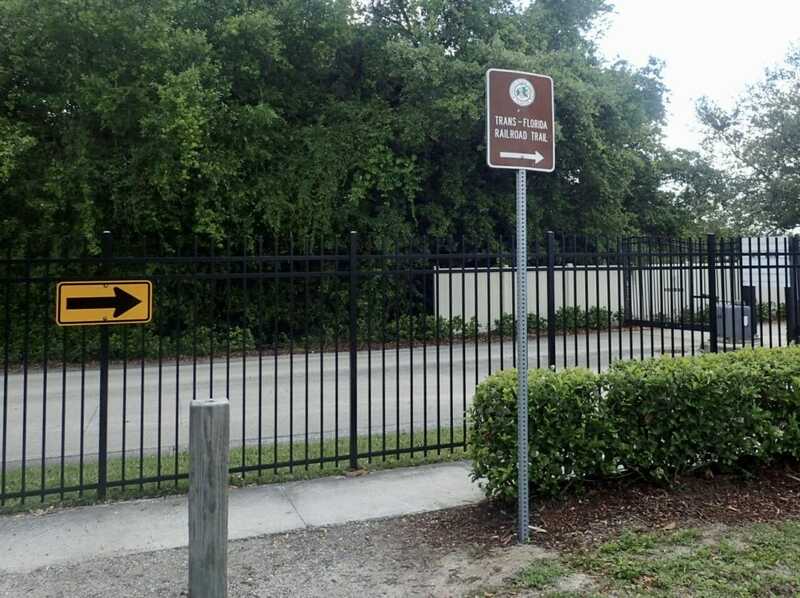 Immediately to the left was a sign that said “Trans Florida Central Rail Trail.” Since we knew Fellsmere was in that direction, and the sign said that the City of Fellsmere developed the trail, we opted to go west, seeing a kiosk and gate in the distance. 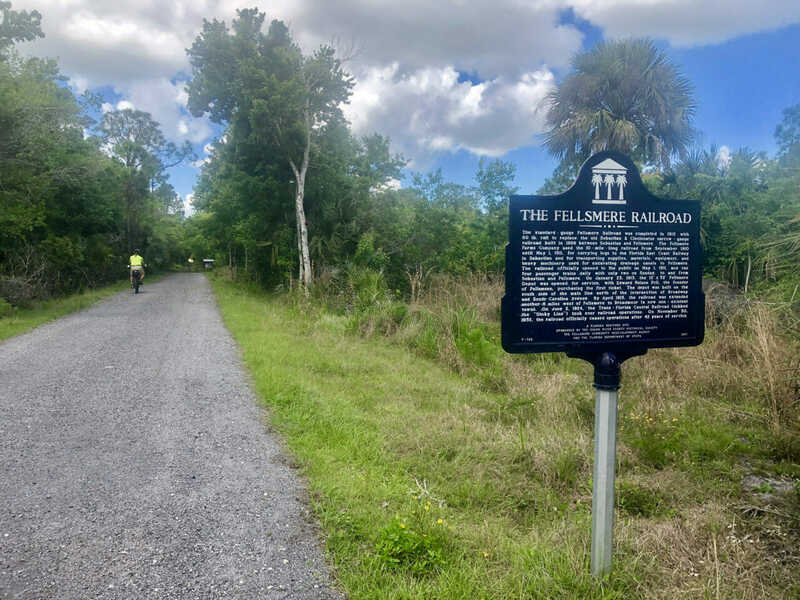 We stopped at the historic marker about the Fellsmere Railroad, then continued through the open gate and end of the pavement into St. Sebastian River Preserve State Park. The path on the old railroad grade was an easy to ride grassy two-track with a few soft places. It’s the type of trail that is perfect for someone just learning to ride off-road: not difficult, but requiring some finesse to avoid the soft and bumpy spots. The landscape opened up into palmetto prairie as we came a dirt road crossing and the overhead power lines. The soft white sand was a good place to stop. 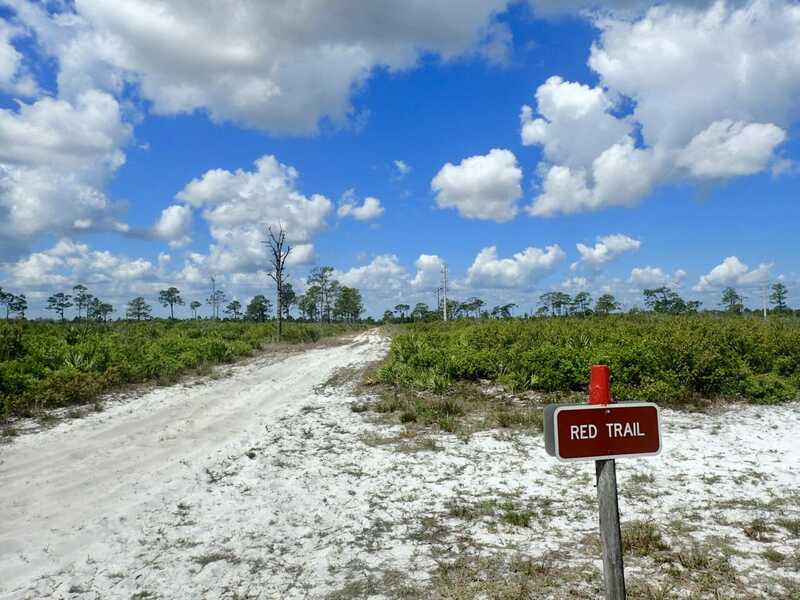 It might be possible to follow this dirt path into Fellsmere, but with the long stretch of soft white sand that I could see off in the distance, it would not be an easy ride. 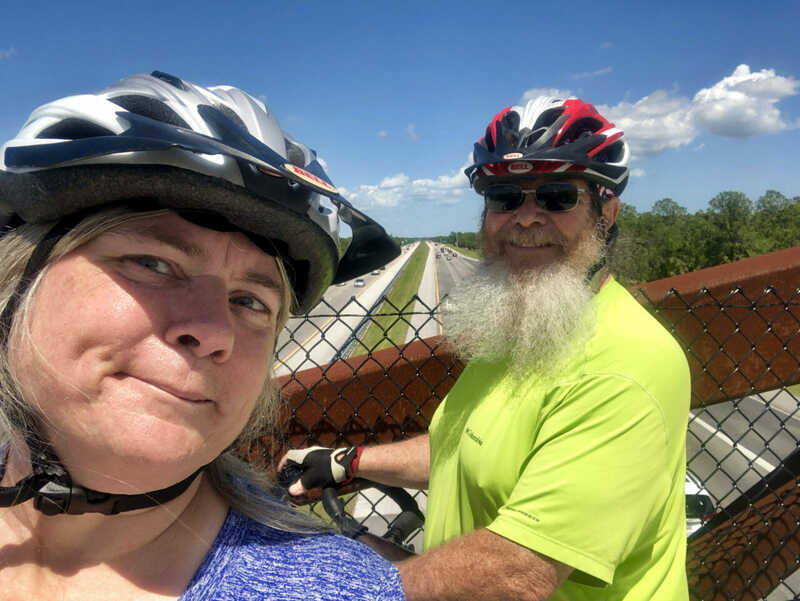 Retracing our way east, we noticed the road to the Florida Tech Challenge Course, a big ropes course that adjoins the trail and I-95. It didn’t take long to reach the climb to the mysterious overpass. The cinder surface changed to pavement as the uphill began. On a Sunday morning, we shared the paved path with a lot of people: walkers, joggers, bicycles, rollerbladers, and whole families out enjoying the trail. The pavement ended two miles later at North County Regional Park at a road crossing. We continued east on a crushed rock path under the shade of the trees with the sounds of folks splashing in the pool at the adjoining aquatic center. Hearing the whistles of the lifeguards and the chatter of all the people cooling off in the water reminded me of my youth in the local YMCA pool. 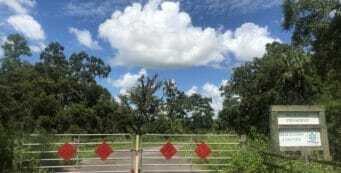 Riding past Sebastian River Middle School along a green chain link fence and the back side of a storage yard, we came to a fence and a private drive into a gated community. 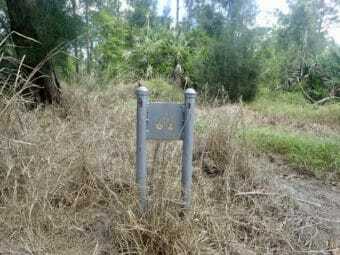 There is a sign with an arrow pointing to a ninety degree turn onto a narrow sidewalk and onto the private road. Biking down that road towards Sebastian Boulevard, it took us a moment to find the trail again. We noticed the Brookside Historical Cemetery first. There is no bike trail signage at the corner of the cemetery. But if you turn left and look off into the distance there is another bike trail sign leading into the woods at the next road crossing. 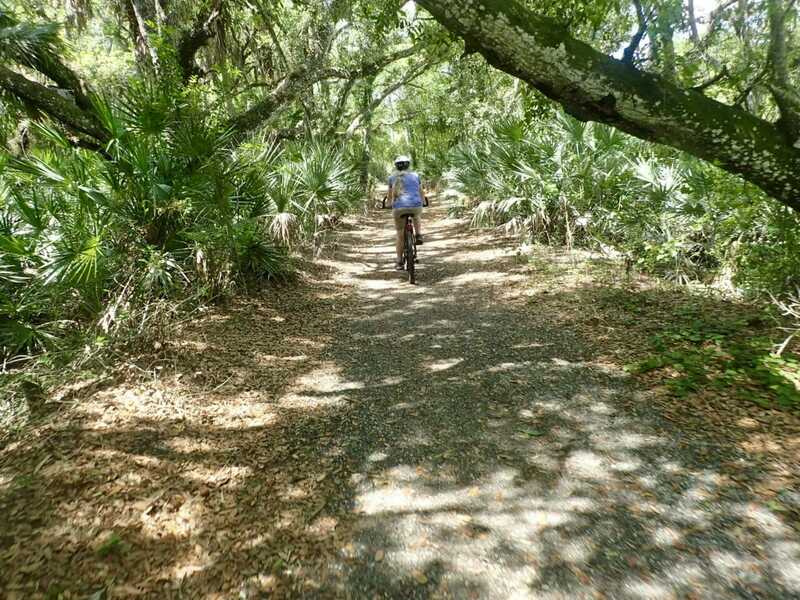 It’s a pleasant windy and shady ride through a stretch of woods until the path makes a sharp right and pops out at a sidewalk along Sebastian Boulevard. 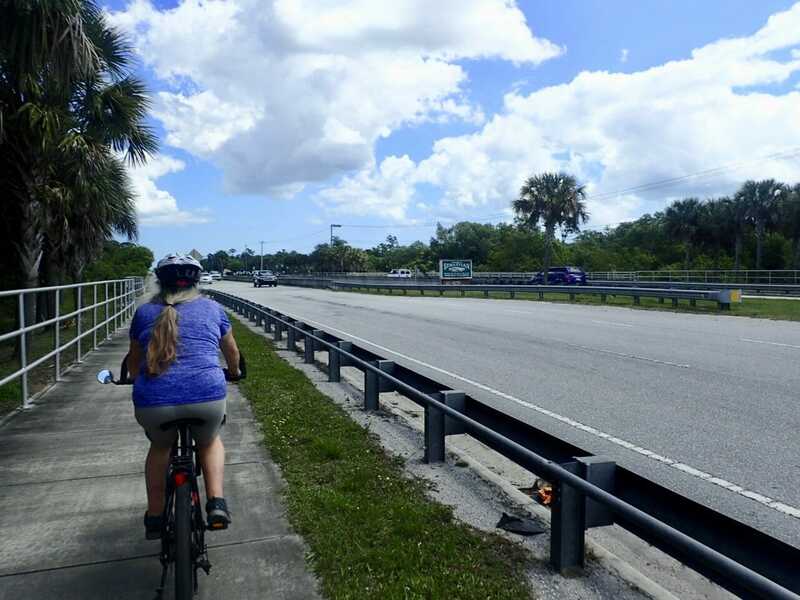 While we saw no more bike path signs in any direction other than the way we’d come, the sidewalk was wide enough that we rode along it until we reached the “Welcome to Sebastian” sign and turned around. There appeared to be a trailhead across the boulevard, but it had no signage nor any way for cyclists or pedestrians to cross the busy road. 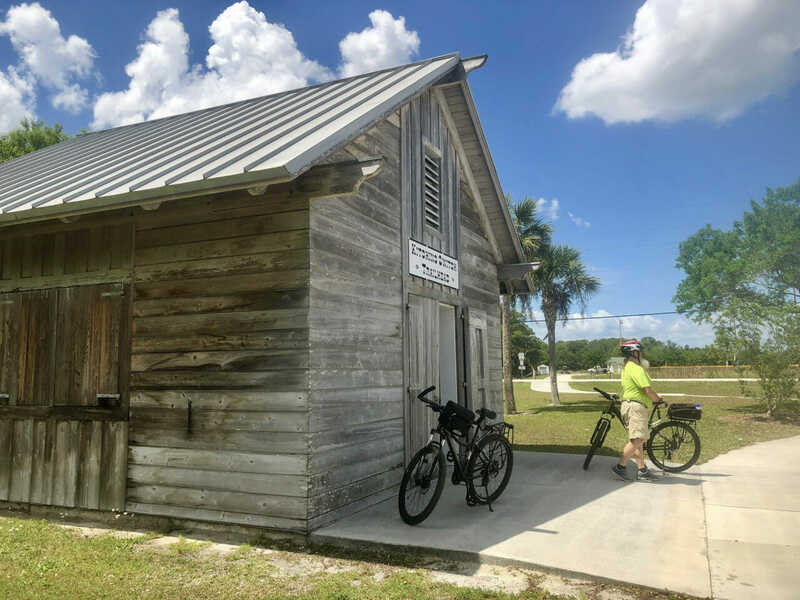 On the return ride, we stopped at the historic cemetery to look around, and at North County Regional Park to visit the Kitching Switch Exhibit Center. After climbing the big hill again to cross Interstate 95, we had to stop for a picture. Plenty of other people – most with children in tow – were doing the same. Everyone wants an I-95 overpass selfie! 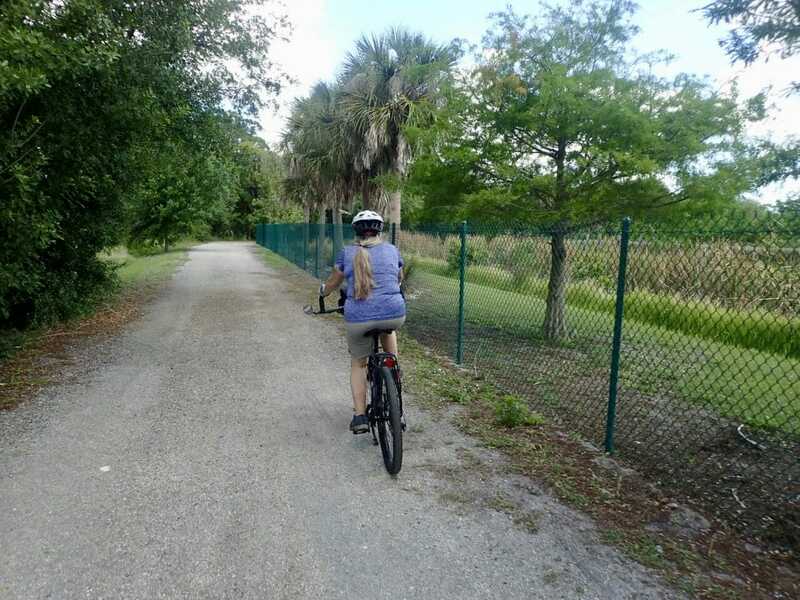 When we got back to the car, I loaded up the bike while Sandy looked around Fellsmere Trailhead Preserve. Along with a lot of interpretive signs, it has a short trail out to an observation deck on a marsh. As we were leaving, we noticed that a pair of sidewalks dead end in a Y shape. We’re guessing they will eventually lead to a nice boardwalk loop around the marsh. 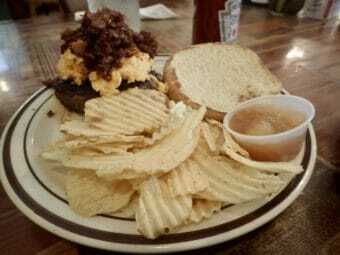 Historic downtown Fellsmere isn’t far away, so we drove west to have lunch at Marsh Landing Restaurant. It’s a unique place, not just for the food but for the location. 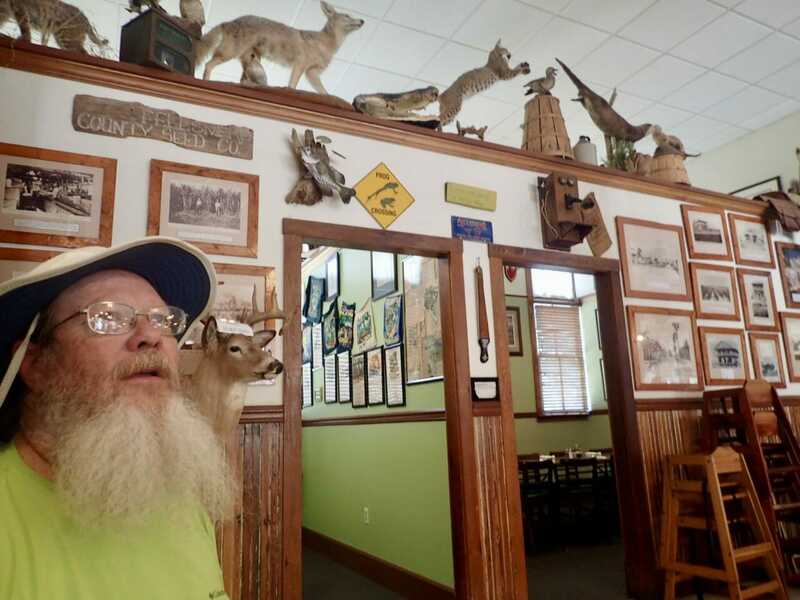 The restaurant is inside what was the land sales office during the 1920s Florida land boom. After that went bust, the building was the headquarters for Florida Crystal Sugar Company. Today, it’s decorated with a mix of antiques and animals. Looking around at all of the stuff on the walls. 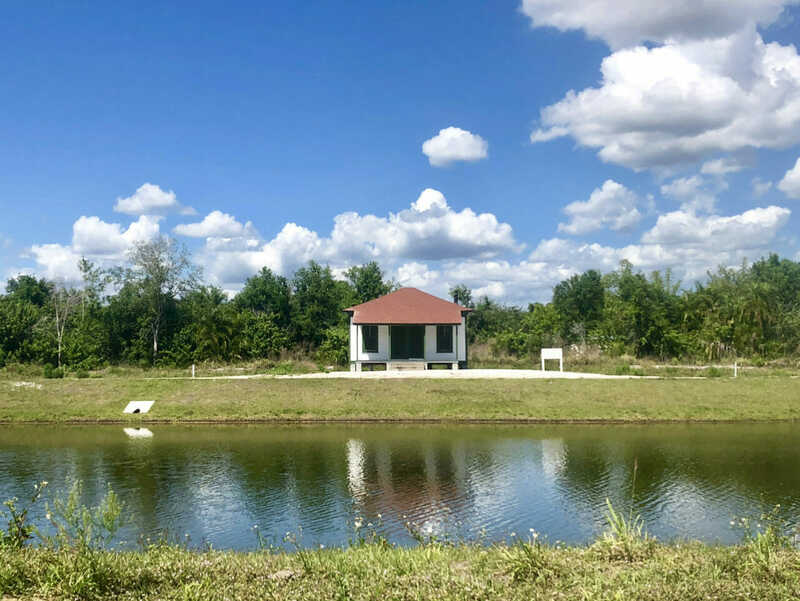 Fellsmere is home to the largest Frog Leg Festival in the United States, and Marsh Landing is a big reason why. You can order those, or gator tail, or a variety of other Southern specialties including swamp cabbage. 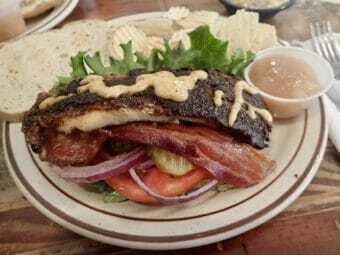 We ordered the Pimento Cheese Burger, an angus burger topped with pimento cheese and Bacon Jam, and the Fat Cat Sandwich, a hearty BLT with Cajun catfish on top. Despite the ride – which was about 8 miles – we almost couldn’t finish them. When we asked the shopkeeper next door about when the trail was coming to town, we were surprised when she said “it’s already here!” On our way out of town, we took CR 507 north to look. It appears there is a rough path along a canal on the edge of town, but no signage or place to park. As the road turned north, it passed what looks like a historic building in a cleared space that might be a future trailhead. 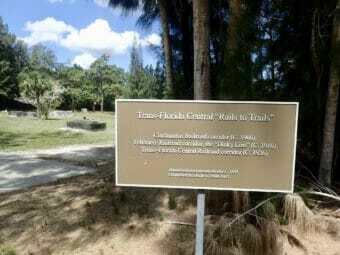 A future trail terminus, perhaps? 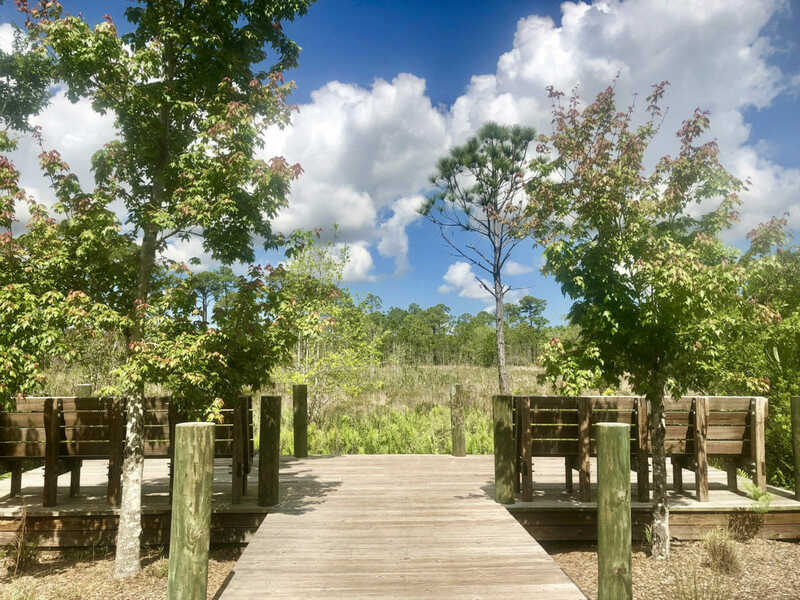 We stopped at St. Sebastian River Preserve State Park. 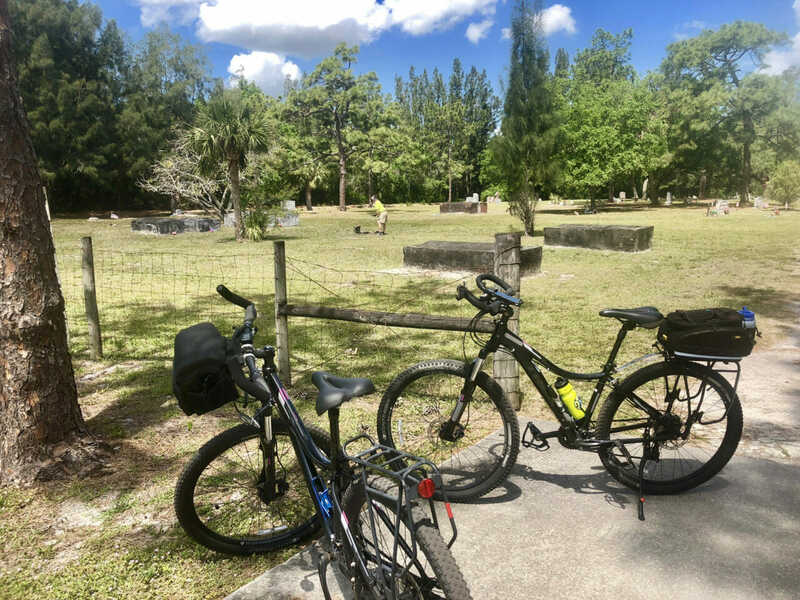 Although this park is mostly in our home county, we haven’t done much exploring there and wanted to know more, especially about the bike path. 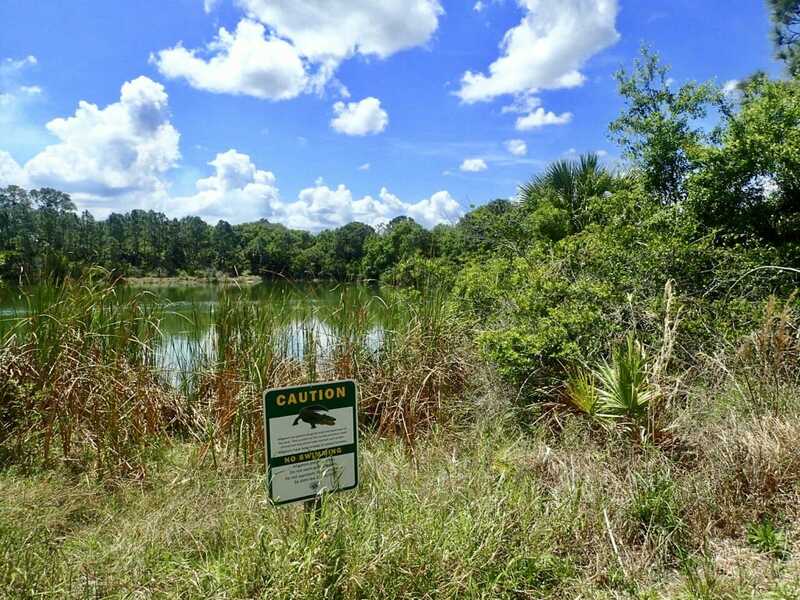 At 35 square miles, this is one huge preserve, broken into quadrants by the Fellsmere Canal and by Interstate 95. Long trails loop through each quadrant. 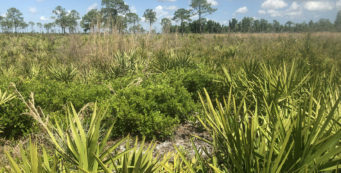 The preserve is primarily managed for Florida scrub-jay habitat and has one of the state’s largest populations of scrub-jays. We knew exactly what she meant. 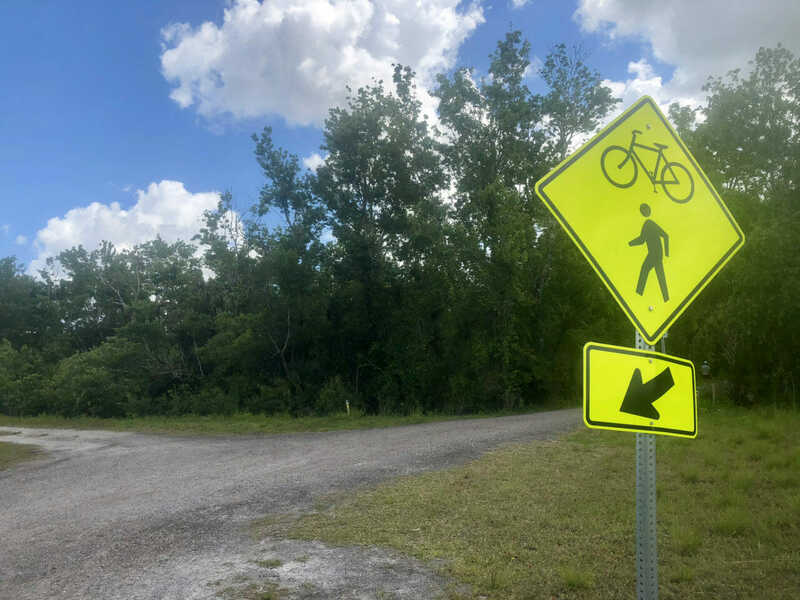 Although we enjoyed biking the paved trail on the Cross Florida Greenway, it made the feel of hiking the Florida Trail between Ross Prairie and the Land Bridge less appealing, with cyclists zipping past within sight of the trail. We mentioned that to her. The soft sugar sand doesn’t work for biking, either. A good compromise would be a hard-packed natural surface topped with limestone or cinders for erosion control. Gathering up a bunch of trail maps, we made plans to return to the preserve for some future hiking and biking. 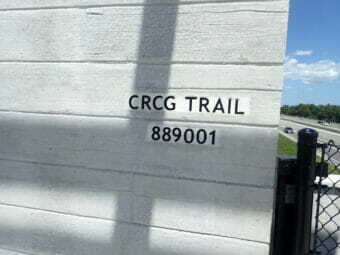 As we suspected, much of the new rail-trail lies within the state park, even though only a few signs hint at it. Because the signage for this trail varies all along it, we aren’t positive which of these names is the proper one for the trail. 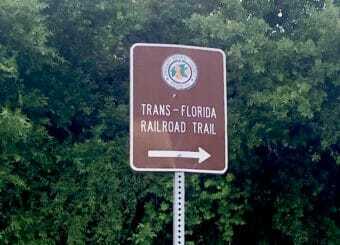 There were more official “Trans-Florida Railroad Trail” signs than any other signage along the trail, sometimes the name had “Central” in it and sometimes not. 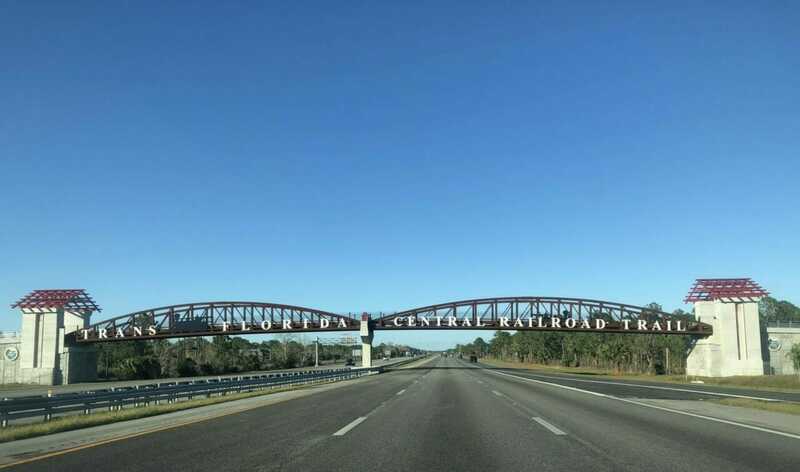 We are guessing that the name posted on the bridge over Interstate 95 will stick. Here is our map of the trail based on our ride. 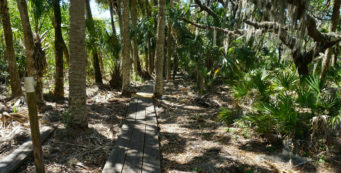 It’s a 0.7 mile round-trip from the Fellsmere Trailhead Preserve trailhead to the trail. We rode a 1-mile round-trip into the state park to the west. It was another 6.5 miles out-and-back to the east, not counting the extra distance we rode alongside Sebastian Boulevard. 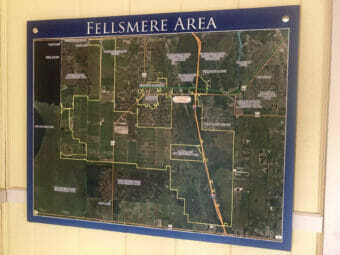 Although we rode from Fellsmere Trailhead Preserve (27.7683, -80.5573), the coordinates on this map are for North Regional County Park since it has the larger trailhead. Both trailheads have bathrooms. 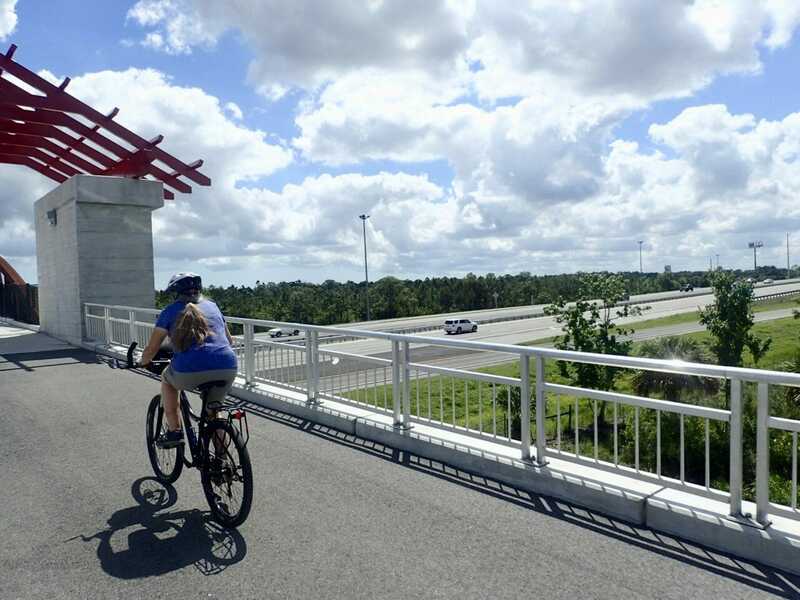 Using North County Regional Park cuts 0.7 mile off the total ride, for 7.5 miles round-trip. Our total mileage for the ride was 8.2 miles round-trip.